ANN ARBOR, Mich. — They may be in small towns. They may only have a couple of surgeons. But for common operations, they may be safer and less expensive than their larger cousins, a new study finds. A University of Michigan-led team carried out the analysis of data from 1.6 million hospital stays for four common operations: gallbladder removal, colon surgery, hernia repair and appendectomy. They compared what happened to patients covered by Medicare who had their operations at 828 critical access hospitals with data from patients treated at more than 3,600 larger hospitals. The risk of dying within 30 days of the operation was the same whether a patient had surgery at a critical access hospital or a larger hospital. The risk of suffering a major complication after surgery, such as a heart attack, pneumonia or kidney damage, was lower at critical access hospitals. 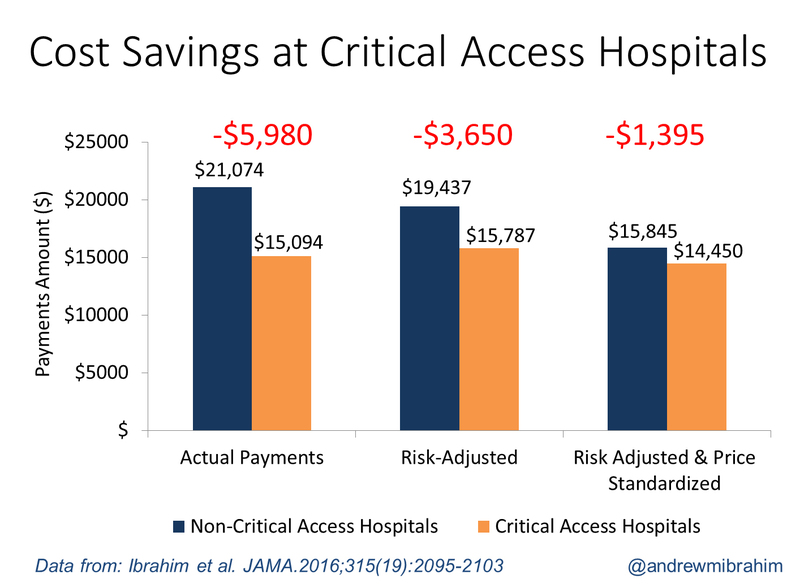 Patients who had their operation at a critical access hospital cost the Medicare system nearly $1,400 less than patients who had the same operation at a larger hospital, after differences in patient risk and pricing were accounted for. The patients who had these operations at critical access hospitals were healthier to begin with than patients treated elsewhere, suggesting that critical access hospital surgeons are appropriately selecting surgical patients who can do well in a small rural setting, and triaging more complex patients to larger centers. But even after the researchers corrected for differences in pre-operation health, the critical access hospitals still had equal or better outcomes. 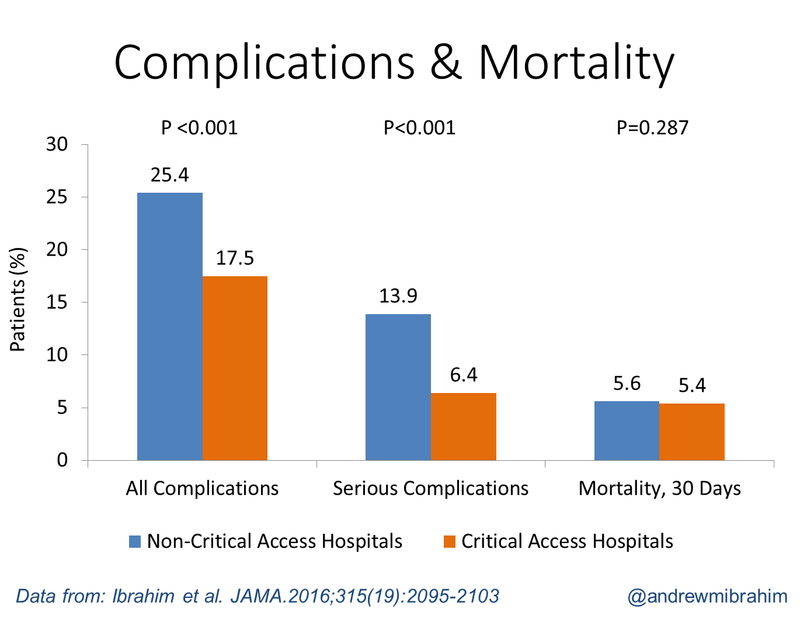 Patients who had four common operations at critical access hospitals had a lower chance of complications, and a nearly equal chance of dying, compared with patients who had the same operations at larger hospitals in suburban and urban areas. The findings are timely because of a current debate over whether to change the national policies that designate critical access hospitals, and determine how much they get paid for medical and surgical services. Hundreds are these hospitals are in danger of closing, threatening local access to care for millions of Americans. Currently, the Medicare system essentially subsidizes them by paying them slightly more than the total cost of care, in order to ensure they can stay financially afloat to serve rural areas. Even still, dozens have closed in recent years. Recent studies of common medical conditions like heart attacks and pneumonia at critical access hospitals have raised questions about how well they care for patients with these conditions. The new study is the first comprehensive look at the surgical care they provide. “From a surgical standpoint, these hospitals appear to be doing exactly what we would want them to be doing: common operations on appropriately selected patients who are safe to stay locally for their care,” says Andrew Ibrahim, M.D., first author of the new study and a VA/Robert Wood Johnson Clinical Scholar at the U-M Medical School. Ibrahim and senior author Justin Dimick, M.D., MPH, worked on the study with Tyler Hughes, M.D., one of two surgeons at the critical access McPherson Hospital in McPherson, KS and a director of the American Board of Surgery. Says Hughes, “The goal of the rural surgeon is best care nearest home. Data to assure that the care in rural centers is both safe and cost effective is critical in the decisions the profession faces in providing care to the 20 percent of the U.S. population living in truly rural environments. This study gives credence to what rural surgeons long suspected -- that well-done rural surgery is safe and cost effective.” Hughes helped the U-M team understand the triage process that surgeons at critical access hospitals use to decide whether to take a case or refer the patient to a larger center. Says Dimick, “For many years, surgeons have debated whether we should concentrate surgery in a subset of our larger hospitals. The downside of this approach is that patients have to travel far from home for surgery, especially those living in remote areas. While it may make sense to travel to a higher volume hospital for a few of the most complex operations, this study shows that having surgery locally is safe for many of our most common surgical procedures.” Dimick, a professor of surgery, leads the Center for Healthcare Outcomes and Policy at U-M and is a member of the U-M Institute for Healthcare Policy and Innovation. Surgery costs were lower for patients who had common operations at critical access hospitals, compared with those who had the same operations at larger hospitals - even after differences in the patient populations were factored out. Less than 5 percent of surgery patients at critical access hospitals got transferred to larger hospitals, compared with more than a quarter of patients treated for non-surgical issues and studied by other teams. Complex operations such as esophagus or pancreas removal were performed so rarely at critical access hospitals they were not included in the study. Under the original provision established by the Medicare Rural Hospital Flexibility Program, hospitals were eligible for critical access designation if they have less than 25 inpatient beds and are more than 35 miles away from another hospital. By meeting these criteria and undergoing critical access designation, hospitals are paid 101 percent of reasonable costs. They are also exempt from certain other limits on Medicare payment that non-critical access hospitals are subject to. Physicians who practice at critical-access hospitals are also able to receive 115 percent of the usual payment for traditional Medicare patients. The new research is based on data from the Medicare Provider Analysis and Review file from 2009 to 2013, after nearly all of the current 1,332 critical access hospitals underwent designation. In addition to Ibrahim, Hughes and Dimick, the study team included U-M statistician Jyothi Thumma, MPH. The research was funded by Ibrahim’s support from the Robert Wood Johnson Foundation and U.S. Department of Veterans Affairs, and by National Institute on Aging grant AG039434.